Wildflowers, the flowers that traditionally grew wild without any tending, can be a divisive issue for people. Some see them as romantic, a token that someone else cared enough to gather them and turn them into a beautiful bouquet. Others see them as the cheap option, proof that someone else did not care enough to spend their money on a more glamorous bouquet from a trained florist. Regardless of the connotations, wildflower bouquets can add a sweet touch to everything from a wedding to a kitchen windowsill. 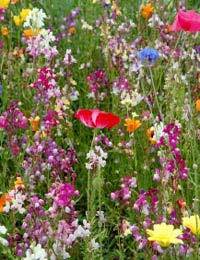 Creating a wildflower bouquet may actually need to start at the very beginning with creating a wildflower garden, but are well worth the effort in the end. In the past, wildflowers took their name from the fact that they were found growing in the wild without the care and tending of a skilled gardener. Today these flowers can still be found all over more rural areas, and even in such surprising areas as the cracks between sidewalk slabs or the strips of grass growing alongside major roads. However, some people love the look and feel of wildflower gardens and cultivate them on their own properties. If you choose to create a wildflower garden, the most preparation you will need to complete is to remove existing growth in the area. Spring, Summer and Autumn can all be wildflower planting seasons, though many traditionalists select the Autumn as that is the natural time period in which existing flowers drop their own seeds. Regardless of the time in which you choose to sow your seeds, patting them into the earth will help to protect them. Pulling weeds and once-a-year or so mowing will help keep the wildflower garden healthy and blooming. Picking wildflowers from public land (or private property other than your own) can be risky. Not only might the owners of the land be upset, but such actions could actually be interpreted as “green crimes”. If you are truly intent on picking flowers from the wild, ask a local gardening or conservation society for recommendations and rules for your area. Otherwise, head to that nice wildflower garden that you have created. Remember not to pick too many flowers as you don’t want to decimate your own garden, and to pick only flowers that have had a chance to mature. The great thing about a wildflower bouquet is that it’s supposed to look a little wild, making it much easier and more informal to create on your own than a rigid bouquet of more exotic blooms. There aren’t any rules to creating such a bouquet, other than that go with what you think looks best. Try to get a nice spread of colours in your bouquet, and try to keep to a nicely rounded shape. Flowers that hang a little should go towards the edge so that they have the room they need once they are put in a vase. Don’t have enough wildflowers for a full bouquet? Little sprigs can make wonderful boutonnieres for men and can be easily tucked into a woman’s hair for some added pizzazz. Individual stems can also be displayed in tiny bud vases and placed around a room to create extra interior interest. Don’t be scared to play around, there’s virtually no way that you can go wrong with wildflowers!